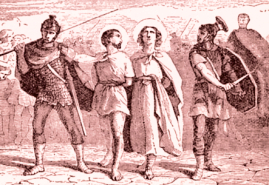 Saint Nazarius, born in Rome, was the son of a pagan military man who held an important post in the Roman army. His mother, honored by the Church as Saint Perpetua, was a zealous Christian, instructed by Saint Peter or his disciples in the most perfect maxims of Christianity. Nazarius at the age of nine embraced the Faith with so much ardor that he copied in his own young life all the great virtues he saw in his teachers. He was baptized by Saint Linus, who would later become Pope. His pagan father was touched by his son's virtue and seconded his project to go elsewhere to preach the Gospel. Out of zeal for the salvation of others, Nazarius therefore left Rome, his native city, and preached the Faith in many places with a fervor and disinterestedness fitting for a disciple of the Apostles. Ten years later he is known to have been in Milan. He was driven from the city by the prefect after being whipped, and he left Italy to go to eastern Gaul or France. There a young boy by the name of Celsus was brought to him; his mother asked him to teach and baptize her son, and to take him for his disciple. The child was docile, and Nazarius did so; and they were never separated. When conversions multiplied, the local governor was alarmed and the apostle was again arrested, beaten and tortured. The wife of this governor was a Christian, however, and succeeded in obtaining liberty for the two young innocents. They were freed on condition they would not preach at this place any longer. Their bodies were buried separately in a garden outside the city, where they were discovered and taken up by Saint Ambrose in 395. In the tomb of Saint Nazarius, whose decapitated body and head were perfectly conserved, a vial of the Saint's blood was found as fresh and red as if it had been spilt that same day. Saint Ambrose conveyed the bodies of the two martyrs into the new church of the Apostles which he had just built. A woman was delivered of an evil spirit in their presence. Saint Ambrose sent some of these relics to Saint Paulinus of Nola, who received them with great respect as a most valuable gift, as he himself testifies, and placed them in honor at Nola. Reflection: The martyrs died as the outcasts of the world, but are crowned by God with immortal honor. The glory of the world is false and transitory, an empty bubble or shadow, but that of virtue is true, solid, and permanent, even in the eyes of men. Peace I leave with you, my peace I give to you; not as the world gives do I give it to you.